Another beautiful day in Paradise. The skies were a little cloudy, the temperature in the 70s and a light breeze out of the SE. 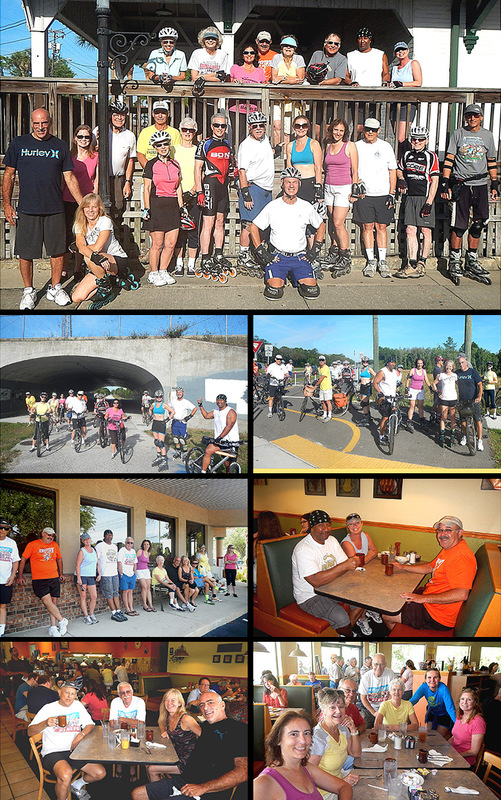 We had 5 new bladers/bicyclers today: Marshal B , Chuck B, J. R., Denise L and Robert L. Welcome. Regular blader/bicyclers that came were Diane S, Rob & Amie H, Glennis W, Herb E, Rick the Breeze & Laura P, Dorey Anne & Bruce M, Cindy S, Patricia K, Bill S, Carol J, Charles C, Dee T, Jeff B, Kim F, Wendy H and Steve G. Welcome all. We did the regular Keystone Road Trail in about 3 groups. One group did 9.4 miles, one did 10 miles and one group did 12.6 miles. We had 6 bladers and 18 bicyclers. This last week Carole T and Cindy S renewed there Sponsorships. Thanks Carole and Cindy for the website support. We Brunched at Rodie's Restaurant as planned. It took about 15 minutes to get seated at three tables as Rodie's was very busy. The service was good considering and the coffee flowed freely. We had ratings from 9.5 to 10. We'll give Rodie's a 9.8.